The terrifying civil conflict engulfing the tiny half-island nation of East Timor is the most traumatic moment in a country that secured its independence only in May 2002 after a quarter-century of occupation by its giant neighbour Indonesia. The violence has since 28 April 2006 cost the lives of at least thirty people, led more than 100,000 to flee the capital, Dili, and created calamitous destruction across the territory. The immediate origins of the crisis in East Timor (Timor-Leste in Portuguese, Timor Lorosa'e in the dominant indigenous language of Tetum) lay in a serious political miscalculation: the decision to sack 600 soldiers (from a national army of 1,400) who had gone on strike in March in protest at what they perceived as regional favouritism in allocating military promotions and benefits towards those from the east of the country. A simmering dispute over the issue, in which armed factions on either side started to organise and polarise, eventually exploded in April-May into a series of riots, assaults and internecine struggles. 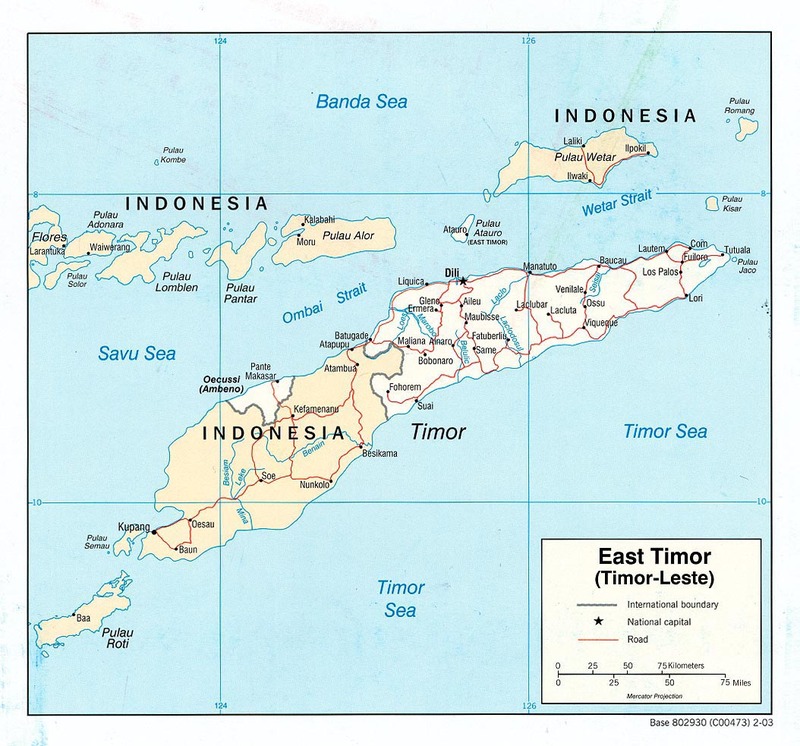 However, the East Timor convulsions are rooted also in deeper sources, including the painful legacy of the long years (1975-99) of Indonesian occupation and the post-independence political rivalries involving some of the young state's leading figures and institutions. The violence of April-June 2006, then, needs to be understood in the context of the first formative years of the new nation. The most important political fracture underlying East Timor's social tragedy divides the president (Xanana Gusmao, hero of the independence struggle) and the prime minister (Mari Alkatiri). President Xanana's faction includes the country's respected foreign minister José Ramos Horta, and also has significant support in the Catholic church to which 92% of Timorese people belong. Mari Alkatiri's power-base is among hardliners in the dominant Frente Revolucionária do Timor-Leste Independente (Fretilin) party. The rebel soldiers and street-mobs who have instigated most of the violence are little more than side-effects of the power-struggle between the two main political groups. Loro Horta earned degrees at Sydney University and Nanyang Technological University, Singapore. He worked in Mozambique for several years, and served as an advisor to East Timor's defence department. He is the son of East Timor's foreign minister, José Ramos Horta. The views expressed in this article are his own. The Alkatiri-Xanana rivalry started as early as March 2001 during the first Conselho Nacional de Resistência Timorense (CNRT) congress in Dili. The CNRT was an umbrella organisation created in Portugal in April 1998 as a mechanism to unify the various Timorese political groups. After the liberation of the country, both Xanana and Ramos Horta wanted to transform the CNRT into a political party of national unity to avoid future political factionalism. However, Mari Alkatiri  already in control of Fretilin, then as now the country's largest political party  refused, and pressed for the dissolution of the council. Alkatiri was a relatively obscure figure who had spent the twenty-four years of struggle for national liberation in exile in Mozambique, where he is known to have had close links with various Marxist and communist groups. Fretilin's role in the campaign for independence, which included brave resistance to Indonesian occupation against overwhelming odds, secured for the party an almost mythical status among many Timorese. Most of the party's leaders, including Nicolao Lobato and Vicente Sahe, were killed during the struggle; other surviving founding members, such as Ramos Horta and Xanana themselves, left the party in the early 1990s to become independent figures for the sake of national unity. With most of Fretilin's leaders dead or no longer inside the party, Alkatiri was able to assume control almost by default. The esteem in which Fretilin was held meant that whoever controlled the party could win the government. Fretilin was the vehicle by which Mari Alkatiri gained power in East Timor. Mari Alkatiri used his dominance of the party to frustrate Xanana Gusmao and José Ramos Horta's plan to remodel the CNRT (which had confined Alkatiri to a minor position) and instead forced the umbrella organisation's dissolution. Fretilin's dominance in parliament then enabled Alkatiri to hinder Gusmao's attempts to draft a constitution that gave substantial powers to the president; the constitution eventually adopted was to render Gusmao, the man who had made the utmost sacrifices for the nation, a mere ceremonial figure. Xanana retaliated by not so discreetly supporting the two main opposition parties (the Democratic Party [PD] and the Social Democrat Party [PSD]) as a way to balance Fretilin's political dominance. This high-level rivalry between president and prime minister became entwined with the internal politics of the security forces, leading the police and army to be divided into pro-Xanana and pro-Alkatiri forces. This factionalism is further exacerbated by regional and ethnic tensions within East Timor. The internal east-west divide in particular, never a serious problem in the past, has been exploited by many opportunistic politicians who have unleashed passions that threaten to get out of their or anyone else's control. Alkatiri's style of leadership, characterised by arrogance and confrontation, has made an influential local enemy: the Catholic church. The church's leaders detest Alkatiri's perceived excessive secularism and his alleged communist tendencies. In May 2005, there was extensive opposition to Alkatiri's decision to make religious education in schools optional rather than (as desired by the church) compulsory. The prime minister responded in a notably cavalier and rude manner; he declared, for example, that he was unworried about the church protests because "since I know I'm going to hell, who cares". Such comments won him few friends among the Catholic church's followers in a country where the institution is a respected part of the fabric of social life. The fact that Alkatiri is himself a Muslim and of Arab origin (the descendant of Yemeni settlers) in an overwhelming Catholic nation means that his combative style is even more likely to reinforce the more conservative and racist elements in the church. The church's displeasure with Alkatiri is reflected in insulting descriptions of him from some of East Timor's influential bishops, of which "communist prostitute" is one of the more printable. The corrosion of political authority in East Timor was reflected in a collapse in morale in the national police force (PNTL) as well as widespread allegations of human-rights abuse. The minister of police until recently, Rogerio Lobato, had been imprisoned in Angola for four years on diamond-trafficking charges in the early 1980s, and was widely known to be corrupt. The decay of the PNTL was further reflected in massive desertions that led to the effective end of the institution. A further source of instability has been the numerous grupos de artes marcias (martial-arts groups). During Indonesia's occupation, many young Timorese joined these groups as a way to defend themselves under its rigours and to channel energies which could not easily find other forms of legitimate expression. Most were and are dedicated to sports, but some members turned to crime and many were used by the Indonesian military as thugs and mobs for hire. After independence, Timor-Leste inherited dozens of these associations, which continued to engage in illegal gambling, smuggling and extortion. The largest, the gorkas, is believed to number some 10,000 members. These gangs use the opportunity of social protests and political disputes to plunder and steal. Their members have in general little political motivation, and are attracted mainly by the prospects of reward from looting shops and other private property. The calimao 2000 group, for example, is coming to resemble a collection of professional thugs for hire. The high levels of unemployment in the country (more than 50%, and as high as 70% in Dili) provide an enormous source of recruits for such groups. Some gangs, however, are affiliated with certain individuals who have political ambitions. For instance, the sagrada familia clan has close links with a former guerrilla commander, Furai Bot, who has been opposing the government since 2001. The fact that someone like Mari Alkatiri was able to end up as the most powerful man in East Timor is a serious historical anomaly. To some extent the unfinished crisis of April-June 2006 can be regarded as a correction of this anomaly, one that should have happened peacefully and constitutionally. There are slow signals of political change, especially a diminution in the authority of Mari Alkatiri: as a result of the crisis, he has been forced to relinquish to Ramos Horta his authority over the police and defence portfolios. In this perspective, a historical anomaly has begun to be addressed  though at a price that has proved terrible for East Timor and its people. Three recent developments involving the international community  the security assistance delivered by East Timor's regional neighbours (Australia and Malaysia) and ex-colonial power (Portugal); the agreement on a United Nations investigation into the crisis; and the 18million development aid agreed by the European Union on 9 June  together offer further hope that East Timor can turn the corner once the immediate crisis has passed. At the same time, Mari Alkatiri's refusal to resign as prime minister, and his declared intention of running again in the 2007 elections, do not augur well. The hurricane of disorder in East Timor cannot be attributed to one figure, but as long as Alkatiri remains in power  hidden behind the protective shield of Fretilin  this poor little country's future will remain a hostage to a political manipulation and division that it cannot afford.